In March 2018, the European Commission adopted an action plan to integrate sustainable finance within the financial system. For this purpose it asked EIOPA and ESMA to submit proposals on how to take ESG and climate risks into account under Solvency 2 and the Insurance Distribution Directive. 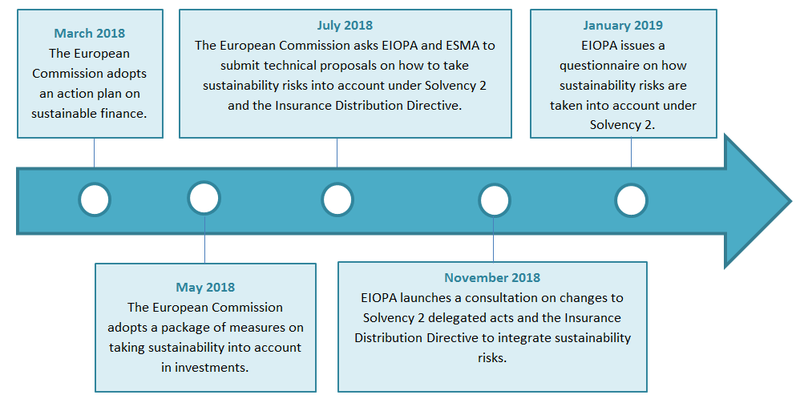 In November 2018, EIOPA released its first recommendations on integrating ESG/climate risks under Solvency 2 and the Insurance Distribution Directive. They were subject to public consultation until the end of January. The recommendations deal mainly with pillar 2 (governance and risk management, ORSA). One of EIOPA’s main proposals is that the risk management key function should be in charge of identifying and assessing sustainability risks, including within the ORSA framework, but also for this notion of sustainability risk to be integrated into the “prudent person” approach when choosing investments. The final technical proposals, developed in concertation with ESMA, will be released by the end of April 2019. In January 2019, EIOPA issued a questionnaire on how sustainability risks should be taken into account. Relies will be accepted until 8 March. Sustainability risks are defined by EIOPA as E, S, and G risks, as well as risks incurred in transitioning towards a low-carbon economy and physical risks (natural disasters in particular), which can affect both the assets and liabilities of companies that are subject to Solvency 2. The main focus is on climate change risk, which is incorporated into the environmental factor. The purpose of the questionnaire is to compile data on market participants to analyse how sustainability risks impact insurers’ investments. The Commission has asked EIOPA to determine whether Solvency 2 contains incentives or obstacles to sustainable investment, particularly investments in non-rated bonds and loans, private equity and real estate. Keep in mind that national supervisory authorities, including ACPR in France, will also be compiling information independently and non-publicly. EIOPA’s questionnaire  is highly precise, and, unlike the November consultation, it includes detailed questions on the risk profile of sustainable investments compared to other assets and how sustainable investments figure in asset allocations. What are the risks and opportunities for insurers’ investments caused by climate change or the transition to a low-carbon economy? How do E, S, and G risks impact the value of financial assets in short-, medium-, and long-term investment portfolios? What about for transition risks and physical risks? What, in your view, are those assets whose valuations are the most sensitive to transition risk? Do you believe that non-rated bonds and loans, private equity and real estate are affected by these risks? What about other assets? Can sustainable investments be seen as investment opportunities? In particular, do they have to be subjected to the same measures of risk and return as other investments? Can you demonstrate that “green” assets have a significantly different risk profile from other assets? Can you demonstrate that assets that are considered “green” or that have less exposure to physical and transition risks are correlated differently than the correlations in the standard Solvency 2 calculation formula? Do you believe that “green” assets should be separated from other assets in an efficient asset allocation? If so, what criteria do you consider in classifying an asset as “green”? Rank investment criteria by order of importance in the allocation: short-, medium-, and long-term expected returns, ALM, market risk of assets, risk-reward profile, and ESG factors. 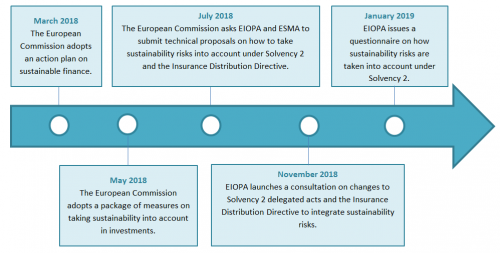 After compiling the opinions and practices of the main market participants, EIOPA will release its technical opinion by 30 September 2019 so that the European Commission can consider proposals within the framework of the 2020 Solvency 2 review. So inclusion of ESG criteria will be one of the components of the Solvency 2 Reporting and Disclosure Review 2020, at least in pillar 2 (governance, risk management, ORSA), because we don’t see how it would be possible at this point for pillar 1 (calculation of capital requirements) to include reduced shocks for assets having the highest ESG ratings, due to the lack of harmonisation in ESG ratings.